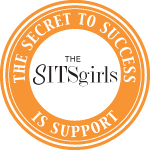 i am so proud of the fact that the children in my family...and those of most of my friends...happily gobble up healthy food loaded with fruit, vegetables, whole grains, good proteins, low in white sugar and high in nutrients. not to say they never eat the other stuff, but it is rare. i think it starts by feeding children excellent food when they are young, involving them in food choices (i love seeing kids at farmers' markets), teaching them to cook and eating as many meals as possible together at the dinner table. picky kids? how do we let that happen? obese kids? why, why, why do we accept this? ok...off my soapbox. today i am sharing a recipe for a dish very popular in italy...chickpea patties. (here is a secret, kids love them!) they can be made with either mashed cooked garbanzo beans (garbanzos and chickpeas are the same thing) or garbanzo flour. i like using the flour for this dish. these patties, served on hamburger buns with all the toppings, are delicious, easy to make, full of fiber, high in protein and low in fat. increase or decrease the red pepper flakes (or eliminate) depending on your, or your kids, tolerance to heat. 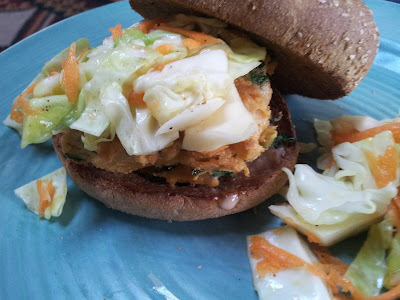 i copied a trick i learned from long meadow ranch in napa regarding the cabbage slaw. this is what they serve on their hamburgers when heirloom tomatoes are out of season...delicious with the chickpea patties adding crunch and, of course, vegetables. so, there you have it, a healthy, delicious meal kids will love...and so will the adults what could be better than that? combine garbanzo flour and next 6 ingredients in medium saucepan. add water and stir to remove lumps. set heat to medium and cook, stirring frequently, for 10-12 minutes or until mixture is very thick. stir in parsley. turn off heat and cool in pot 5 minutes. line a baking sheet with parchment paper. using a large spoon or ice cream scoop, create patties using 2 spoonfuls (or scoops) for each patty. press down lightly to form each patty. depending on size of scoop you should get 6-8 patties. heat 2 tbsp olive oil in large skillet. fry patties until each side is golden brown (2-3 minutes per side). 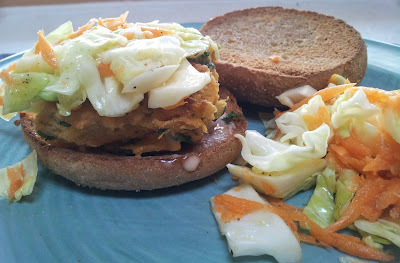 drizzle olive oil over inside of each whole wheat bun. heat oven to broil setting. place buns under broiler until golden. remove from oven. 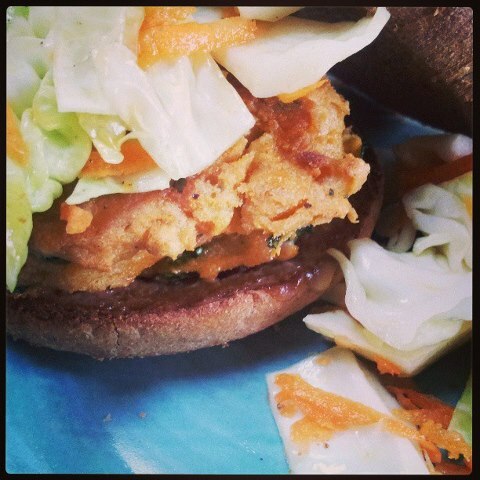 to assemble burgers: place one chickpea patty of the bottom of bun. top with cabbage salad or, in season, a slice of heirloom tomato and lettuce. add a small dollop of chipotle mayo and top of bun. serve. The Heritage Cook: Duck Fat Fries, a Kid's Favorite Snack! southern california is flooded with "hole in the wall" mexican restaurants, sometimes called taquerias. almost all have amazing, delicious, fresh food which is made to order for either eat in or take-away. i travel to california frequently to visit my family and i always need my "mexican food fix" a few times while i am there. one of my favorite dishes to order is potato tacos. (tacos de papa). 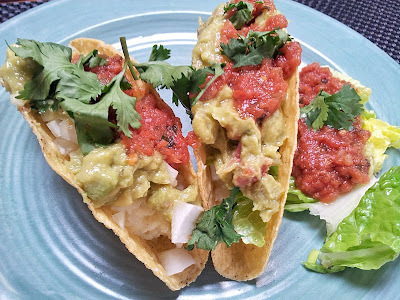 seasoned potatoes stuffed in a fried corn tortilla with your favorite toppings, this simple and easy dish is surprisingly delicious. you can use leftover mashed potatoes, but i like to make mine fresh and season the potatoes with roasted garlic. i keep a bit of texture in the potatoes...i refer to my recipe as "smashed" potatoes, but you can use whatever you like. 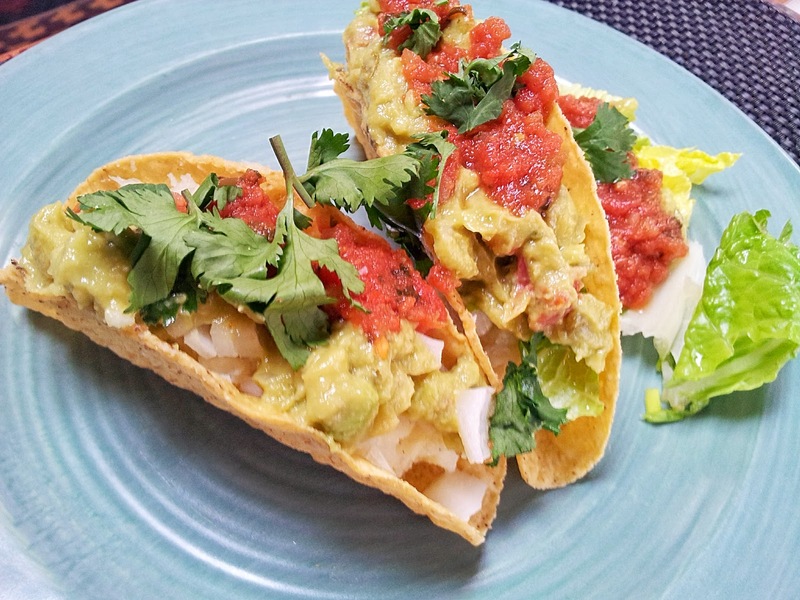 freshly fried corn tortillas are wonderful, but to make this dish even easier i often use organic packaged taco shells. my favorite brand is bearitos and/or whole foods. 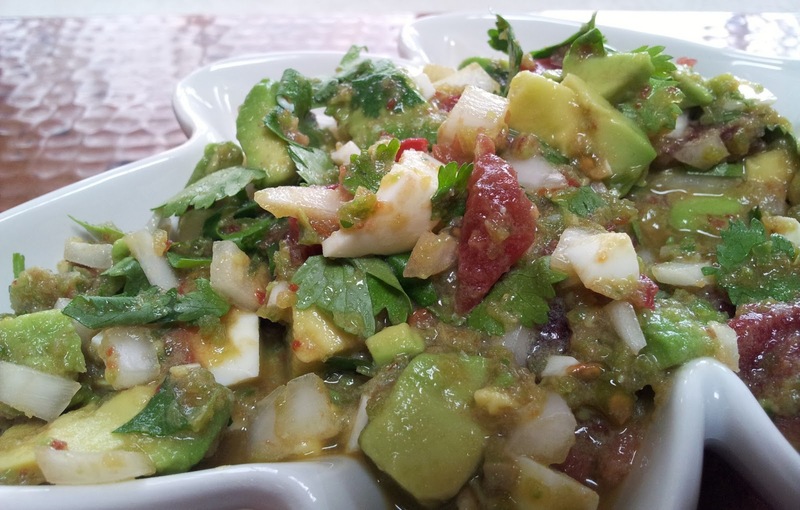 this is "no-cook" week at food network's "sensational sides mixed with spring produce fest" and i decided to share an unusual and delicious salsa. now, i must confess, there is a little bit of cheating here. the "unusual" ingredient is a couple of hard boiled eggs...not exactly no cook. but i often have hard boiled eggs in the fridge...a perfect protein snack...so this was no cook for me today. if you want to stay pure with this week's theme, pick up a cup or so of chopped eggs at your market's salad bar. either way, this easy-breezy, fast recipe is worth "cheating" a bit. i first had a similar salsa at a south american restaurant years ago in new york . 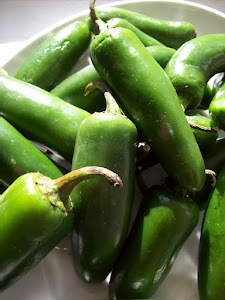 they used different chiles but i experimented with ones i could find locally. i love this with tortilla chips and as a topping for soft tacos (beef, pork, chicken or vegi), but have also used as a accompaniment to steak, roasted chicken or fish. whatever you do, don't leave out the aforementioned hard boiled eggs. 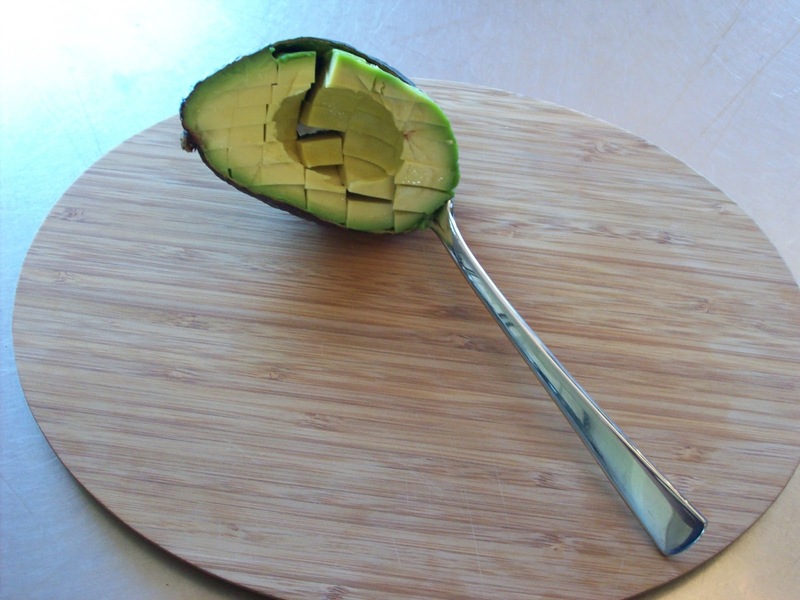 they add body, texture and taste. wonderful! 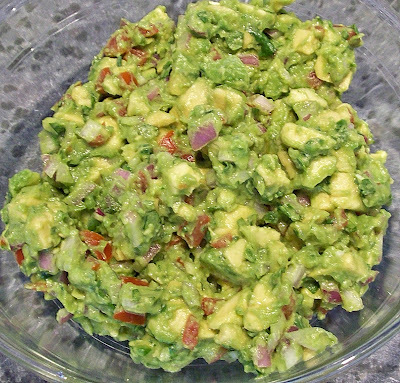 add the chiles, vinegar and salt to a blender and puree. in a medium bowl, add the avocado, eggs, tomato, onion and cilantro. stir to combine. 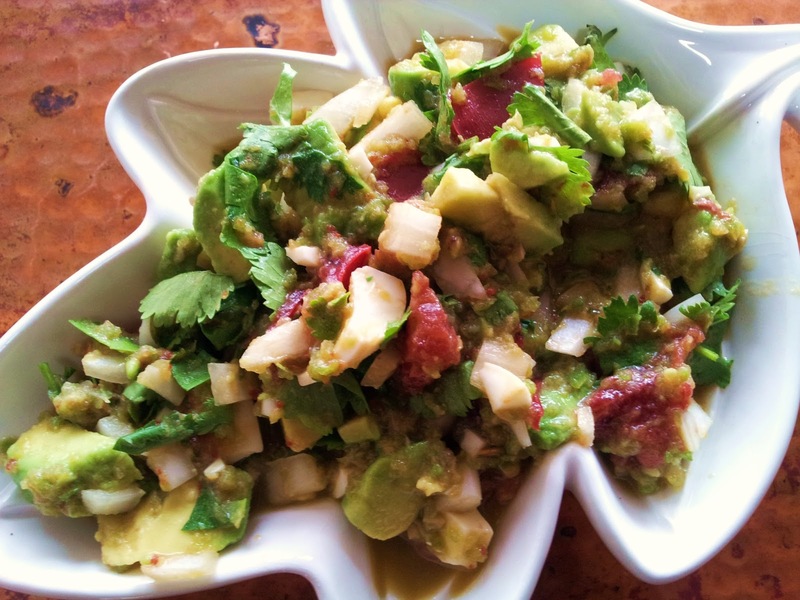 pour in the chile puree and gently mix together all ingredients. season to taste with salt and pepper. my local market features many really wonderful grains in their "bins" section. 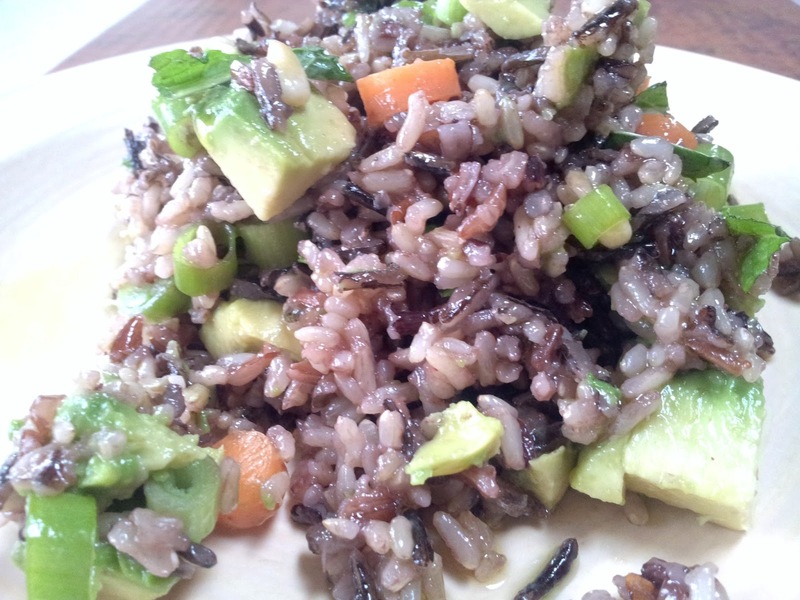 i recently tried an organic wild rice blend which sounded delicious...organic long grain brown rice, sweet brown rice, wild rice, whole grain wehani rice and whole grain black japonica. wonderful. described as "very nutty in flavor" it was tender but still "al dente", sweet and, as described, nutty. perfect for pilafs, stuffing or salad. really good in today's recipe but any type of rice or rice blend would work so use whatever you like and/or is available in your area. this is "grains" week at food network's "sensational sides mixed with spring produce fest" . The perfect time to share my wild rice salad with avocado, carrots & jalapeno. a little bit spicy, crunchy, creamy and fresh tasting, this salad packs a punch of flavor. perfect on greens for lunch or paired with roasted meat, chicken or fish. i even like it with black beans and salsa spooned into a tortilla for a vegetarian burrito. give it a try...and please let me know what you think in the comments section of this post. 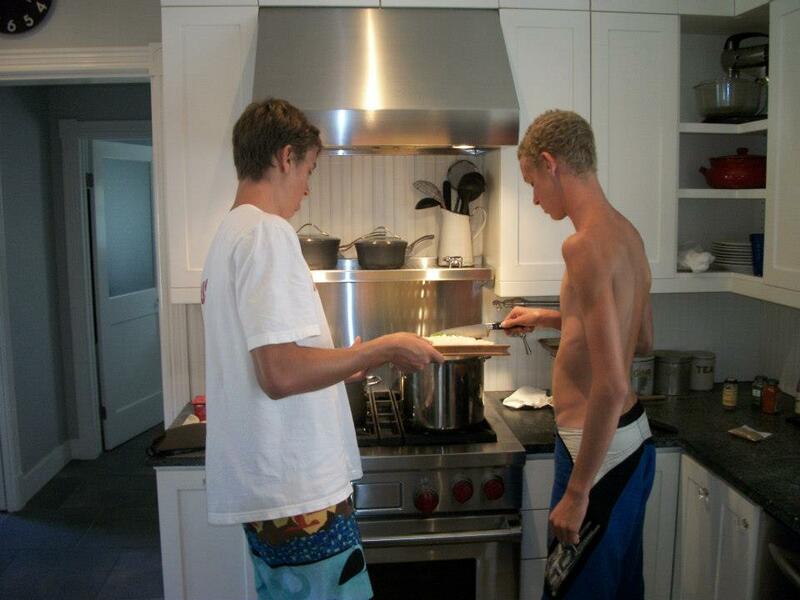 bring water to a boil in large sauce pan. add rice. reduce heat to medium and cook for 5 minutes. reduce heat to low and simmer, covered, approx 40 minutes or until water is evaporated and rice is tender. pour rice into large bowl, fluff with fork and allow to cool to just warm. 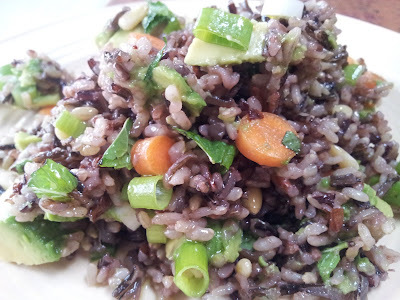 add avocado, carrots, scallions, pine nuts and cilantro to rice and stir to combine. in a small bowl whisk together the olive oil and vinegar. add a pinch each of salt and pepper, stir to combine. pour dressing over salad and stir. season to taste with salt and pepper. just before serving, squeeze lime juice over salad. recipes for roasted radishes seem to be popping up everywhere. it seems like every food magazine, blog and tv chef is sharing this dish so i decided to give it a try. i love roasting vegetables...the caramelized sweetness just knocks me out. i saw local new spring asparagus and radishes at the market last week and imagined the two vegetables roasted, drizzled with balsamic and sprinkled with a bit of red pepper flakes. the result? delicious. 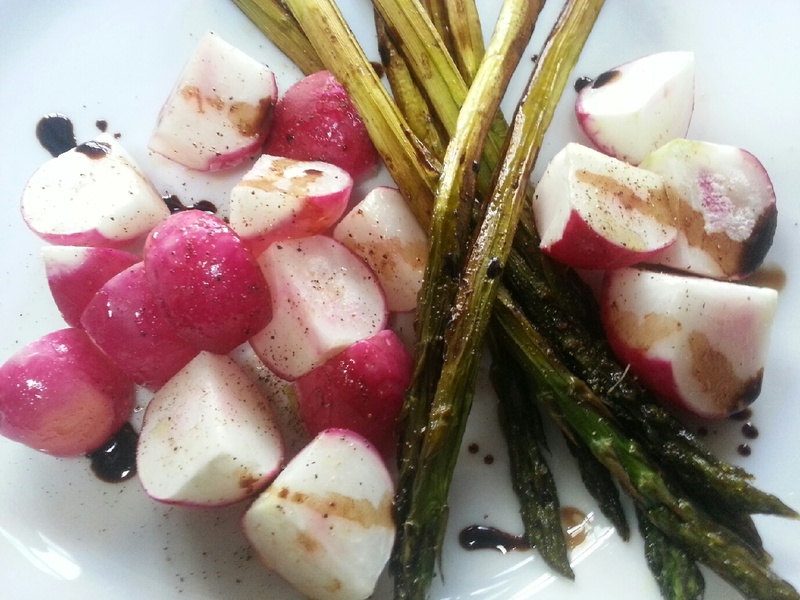 the roasting mellows out the bite of the radishes...making the partnership with the sweet asparagus and balsamic vinegar a hit. the tiny bit of heat from the red pepper flakes pulls it all together. serve as a first "salad" course, or as a side dish with your favorite roasted meat or poultry recipe. a lovely spring supper. preheat oven to 400 degrees. line a rimmed baking sheet with parchment paper. place asparagus in a single layer on prepared sheet. drizzle with olive oil and sprinkle with salt and pepper. roast for 10 minutes. 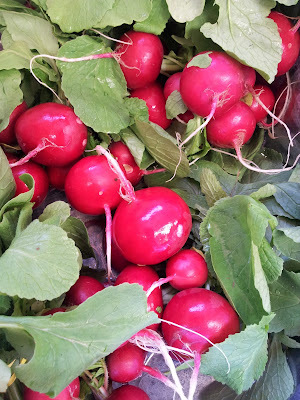 remove from oven and add radishes to pan. drizzle with olive oil and sprinkle with seas salt and pepper. lightly drizzle balsamic vinegar and sprinkle red pepper flakes over vegetables. 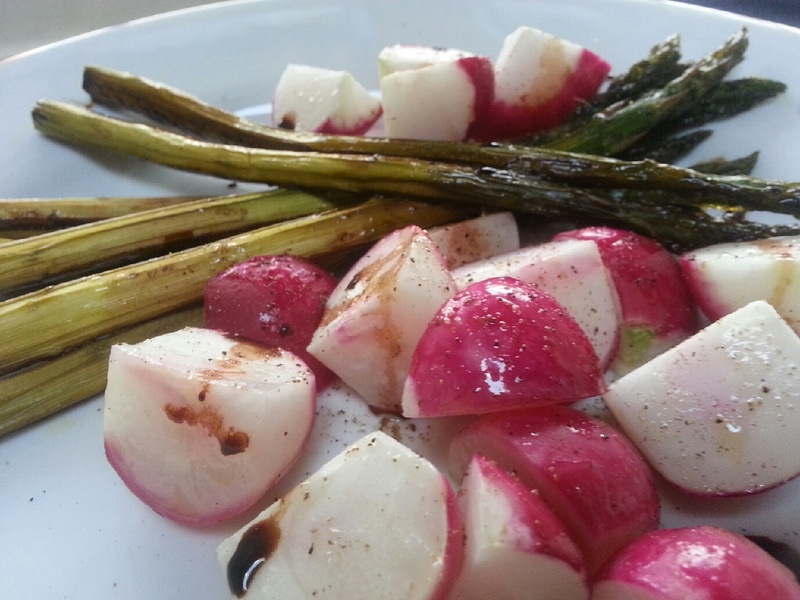 return to oven and roast an additional 10-15 minutes or until asparagus are starting to brown and caramelize and radishes are softened when pierced with a knife. remove from oven and serve.